It’s summer and for whatever reason, readership tends to go down in the summer. People are busy with vacations and vacation planning. After work hours and weekends are dedicated to family and outdoor fun. That’s the way it should be. I do have some specific essays that I want to write this summer but I intend to be a little less regular until the end of August when I will return to my weekly publishing schedule. I may also post one or two essays this summer that are not directly related to my normal subject matter. Call it summer recreational thinking/writing. Watch for those and let me know what you think about them. There are a couple of big changes coming up for me this fall that I will write about later. I think you will find those changes very interesting. The next few years are going to be an exciting time for those of us in the pharmaceutical and track & trace businesses. Stay tuned to RxTrace for more ideas, perspectives and analysis–no matter what happens in the end. In the mean time, enjoy your summer while you can. I am! Dirk – Have a great summer! Continued good luck with the blog. Good call! 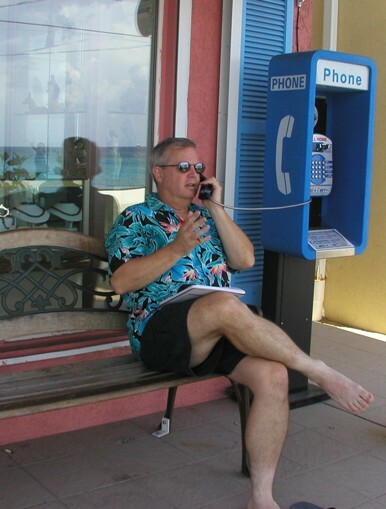 That photo is from a 2007 vacation to Grand Cayman Island where I took a number of work calls, but this particular photo was a setup shot. I particularly like the reflection of the beautiful blue-green ocean in the window. The actual calls I made while we were there were made via Skype, of course.